improvements. The savings are made even greater when combined with rebates from Energy Efficiency Alberta and any in-store retail rebates. resulting in reduced greenhouse gas emissions. When you use less water, you are accomplishing the same thing: reducing the amount of energy required to process and deliver it. This brochure and October 2018 additions provide a guide for Brazeau County residents for the savings available through the Municipal Energy Efficiency Rebate Program. More information on Provincial savings can be found at www.efficiencyalberta.ca. 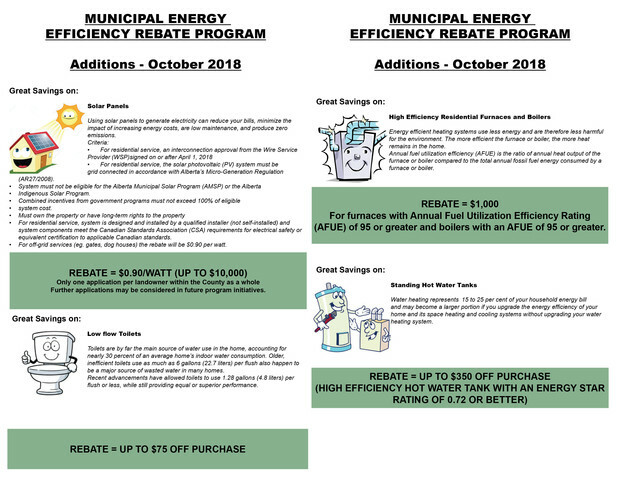 The rebate savings form can be found here. The solar rebate form can be found here.